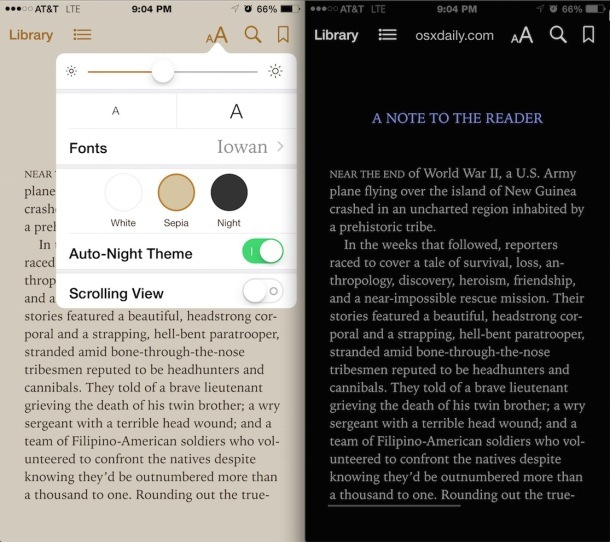 If you use iBooks and your iPhone, iPad, or iPod touch to read, you can improve your evening reading experience by switching the theme to Sepia or the “Night” color scheme. Up until now though, you’ve had to perform that theme change yourself, and if you get caught up in a good book, you know it’s easy to get sucked into the book only to later realize that your eyes are perhaps overly strained due to the glaring white background and bright screen of the iOS device you’re reading on. 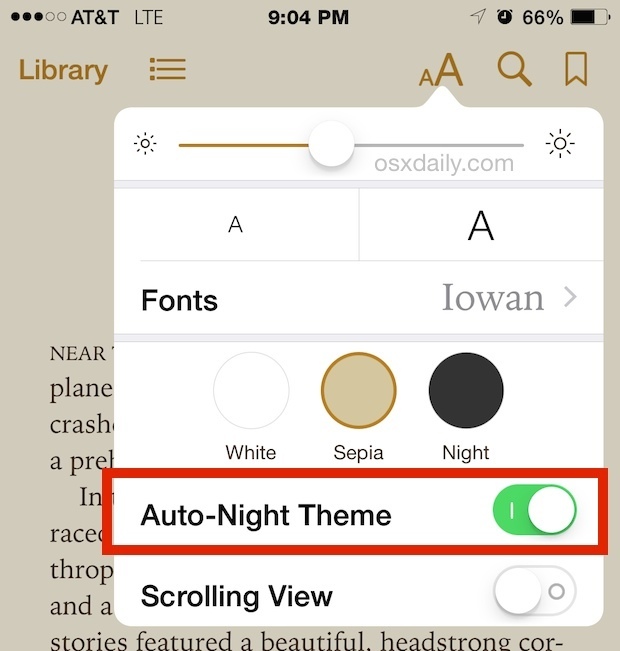 Auto-Night Theme is a new feature in iBooks that aims to prevent such a problem. It uses your location and time to detect when the sun is down (or coming up), and automatically switches into the Night theme when daylight is over (the Night theme is a black background with light grey text, significantly reducing the light put off by the device screen). This is a really great feature that’s well worth enabling if you read on the iPhone, which is now better than ever on the big screens, or an iPad. Even with Auto-Night Theme enabled, I still continue to recommend using the “Sepia” theme as the default, since it’s just much less offensive on the eyes when reading for an extended amount of time. That combined with boosting the font size, reducing screen brightness, and some other iBooks tricks, and you can really dramatically improve your reading experience in iOS with the iBooks app. Let’s hope some of these features make it to the Mac too. I wish Apple would integrate fLux into OS X and iOS so we could have this system-wide. I use it on my computers and on my jail broken 5s 7.1.2, but can’t install it on anything ios 8 until there’s a jailbreak. Agreed, Flux is excellent for night time use, I use it on the Mac. Would anyone say that the sepia is better for when reading a low lighted area or is the black background the vest way to go with the white for the words color? I have 8.0.2 on an iPod Touch 5, but there is NO “Auto-Night Theme” setting in that dialog, there is only the “Scrolling View” setting. Does that have anything to do with location settings? No. It appears that this feat only works with iBooks. Unfortunately it doesn’t work with PDFs. On the iPod Touch 5, it does not work. I tried it with several iBooks. I don’t have any PDFs in my iBooks lib. You need to update to the latest version of iBooks, the auto-dark mode feature is only included in the newest version of iBooks. I first discovered this night time feature a few months back on my iPad while adjusting the font size during some reading. It has totally changed my mind about reading on an iPad… the white/grey text on black is so much easier on my eyes. Is there a way to turn off/adjust the black background within the iBooks app itself? I can only adjust the setting when I have a book open and books with a lot of black on the cover are almost impossible to see on the screen. I am ready to throw in the towel on iBooks. The settings are only to correct in an ibook. And when I return to an pdf-file the screen changes again to the night look. That’s not so nice.